Most litter trays are designed for humans rather than cats. When buying a litter tray for your cat, first consider the size of your breed and consider how it defecates in the wild. For instance, can you really see a cat in the wild taking the time to battle with battery-operated or electric self-cleaning litter trays? Consider how scary it must be for a cat if a self-cleaning tray suddenly starts operation before the cat has finished its business. Most designer trays are just that – designed for the human eye and our fickle love of gadgets, but are completely unnatural for a cat. Most litter boxes come with hoods, but in the wild cats like to see all around them in case of an ambush. In a multi-cat household where different personalities exist, it’s worth considering how a shy cat would feel entering a closed-in space where another cat may be waiting outside to ambush it or block its path. Also consider how a cat likes to move around to position itself and remember that this position may be standing up and resting its front paws on the side. 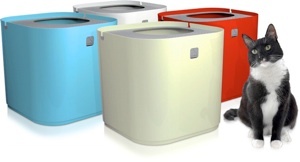 With a covered litter box, a cat may not be able to stand as it wishes. I have two huge Norwegian Forest cats. Even the largest commercially available litter tray is not big enough. I watched them circling in the box scraping the sides with their paws trying to cover their toilet. I never used the lid on the box as this would have thwarted their body positioning and taken away their free choice on how to stand. Also, cats’ urine contains ammonia and this smell fills up the insides of a box. Consider that for a cat, whose sense of smell is second to none, the smell of it’s faeces and urine in a confined space may be unpleasant. 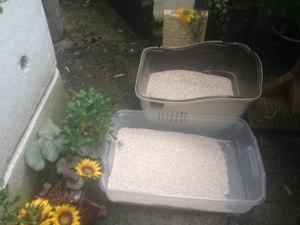 The photo above shows my old litter tray at the top, which was sold as extra large, and next to it, a plastic storage box which I bought for £9 in my local DIY shop. I put them out in my porch entrance to show you the differences in size. The storage box got the paws up from my cats and now they will have plenty of space to dig, cover and manoeuvre, as well as see all around them whilst doing so. 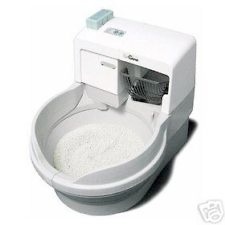 Below I would like to highlight several litter boxes which are not really designed for a cat and the reasons why. These boxes are made for the cat to stand in one position with it’s head sticking out of the hole at the top. It gives no room for manoeuvring unless your cat is the size of a mouse. It has to jump into the box via the hole at the top and, because it is so small, the cat will not really have the space to cover it’s toilet. I have never seen any cat cover it’s toilet with these type of trays. Yes, they look great and come in lots of pretty colours but not a sensible choice for a cat! 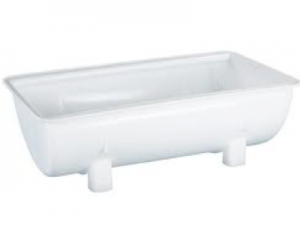 The tray above runs on electricity and rakes the ‘waste’ into another compartment about 10 mins after a cat leaves the tray (motion sensor) BUT, if the tray malfunctions (nothing is 100% accident proof) a cat could get caught in the middle of its toilet. 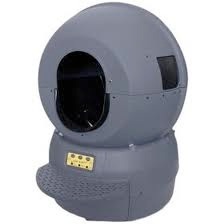 This would not only scare a cat, but could also injure it. It’s a silly over-complicated contraption that was designed once again for humans, and not for cats. Here are some other over complicated litter trays. 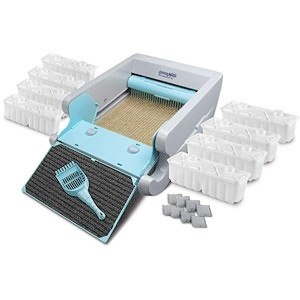 To sum it up – your cat’s litter tray should be simple, large, and mostly unhooded, although I do understand that some cats MAY prefer a covered box, so see what works best for your cat. If you do get a hooded litter tray, make sure your cat can move freely inside it and take off the flap so that fresh air can get inside. Don’t line the tray with paper of plastic. Not only does this get in the way of a cats natural digging, it is an unnatural substance in the toilet area and the plastic/paper soaks up the pee and becomes rancid and smelly. Very unpleasant for the cat, even though you think it may make your life easier. Position litter boxes in quiet low (human) traffic areas and with more than one entry and exit point so that another cat cannot block its access. This is where more than one litter tray is essential.